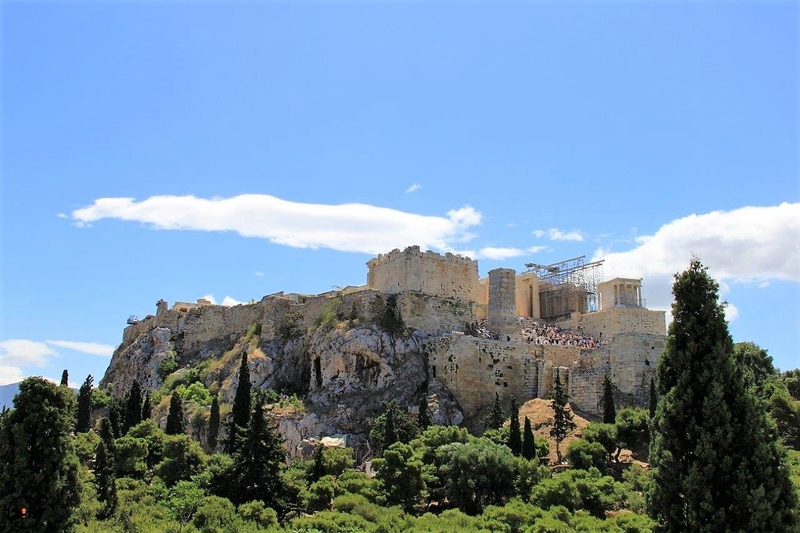 The Acropolis is the central figure in all of Greece. 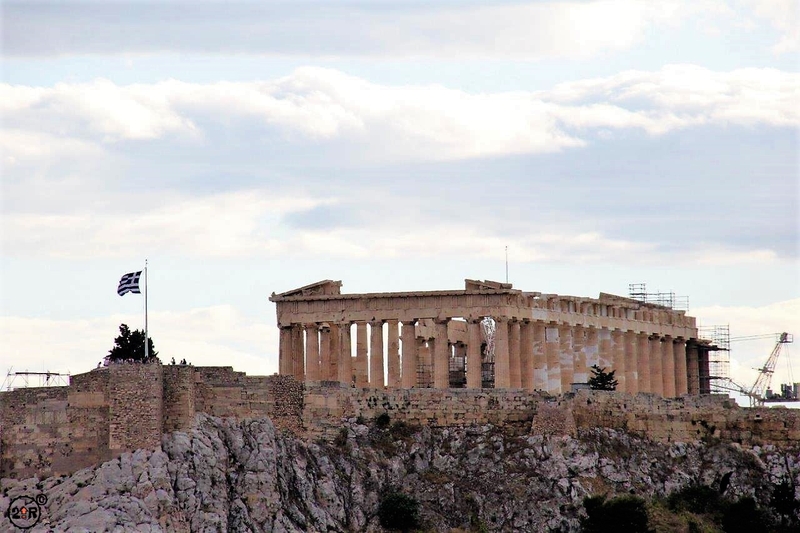 The Parthenon is the central focus of the the Acropolis. 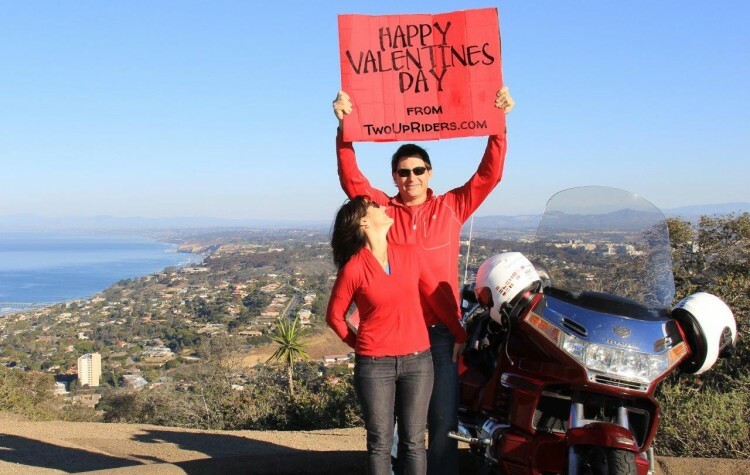 It was humbling to stand in the shadow of one of the most famous places on all of the Earth. 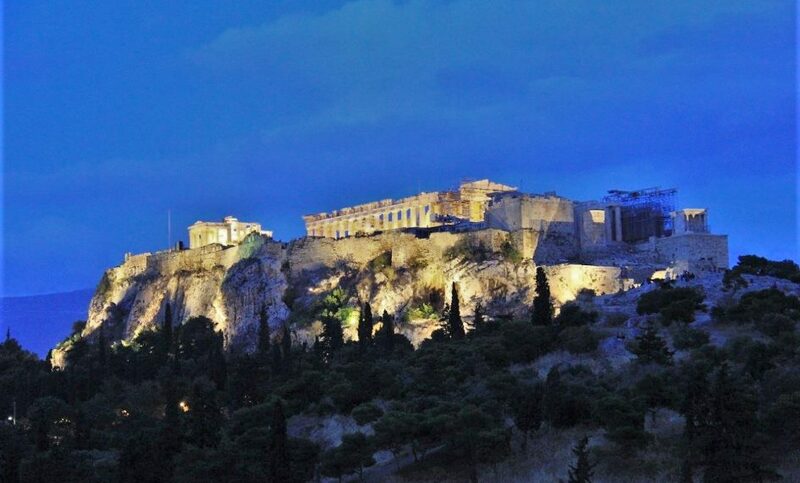 Speaking of the Earth, the Acropolis on which these beautiful building stands, is a bit of a geological enigma. The limestone (Crest Limestone) hill dates to about 100 million years ago, but it is sitting on top of a schist (Athena Schist, a metamorphic rock) that is only 72 million years old. This is what we call in geology a klippe. It’s a German word to describe a rock formation that is not in the same place it was formed. 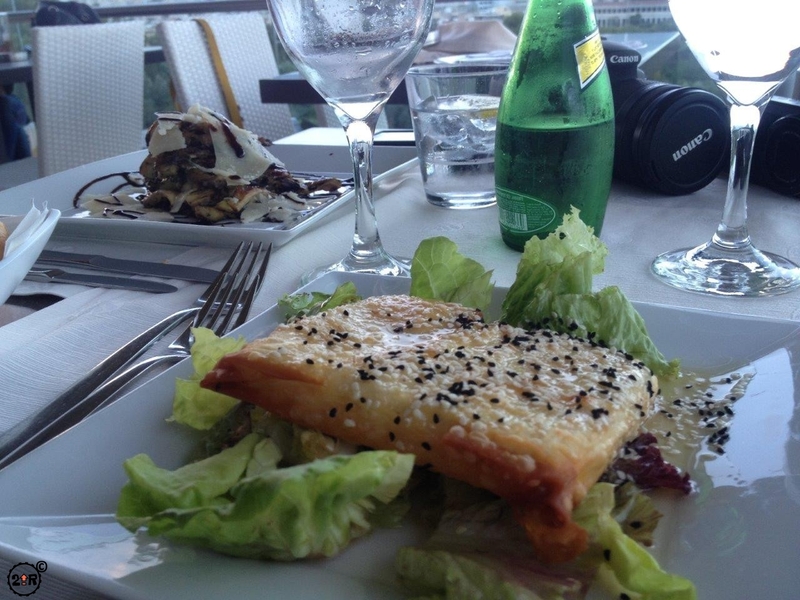 The schist is an autochthonous terrain which means it is in place, where it formed. The limestone is an allochthonous terrain, meaning it was formed elsewhere but has been transported to its current location by extraordinary geologic events. 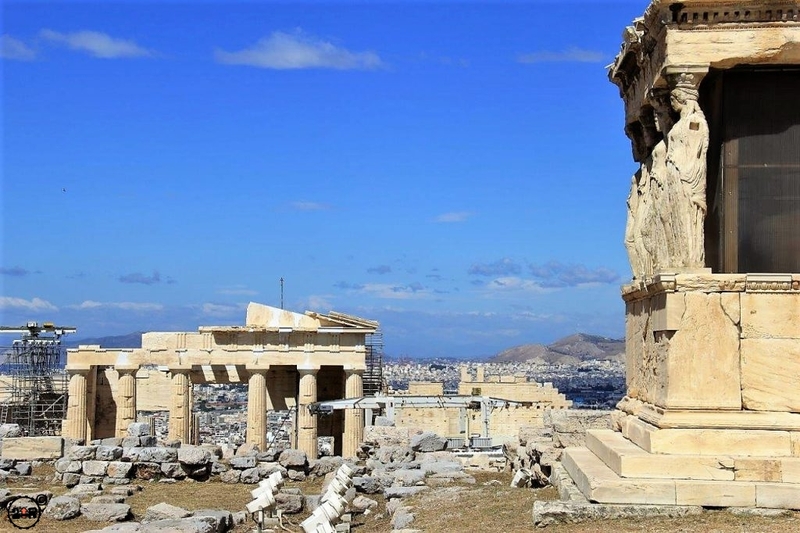 What this all means is that the Acropolis is not only an amazing location with regard to human history, but is geologically unique as well. 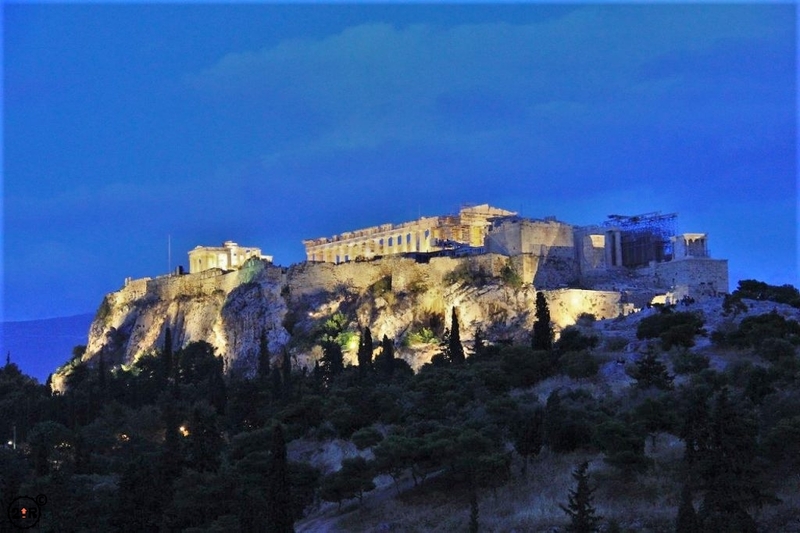 The Acropolis is spectacular when viewed from most any direction in Athens. The picture above was taken form the northwest at night, aglow from the lighting below. The photo below was taken at sunset from high atop our hotel from the northeast. 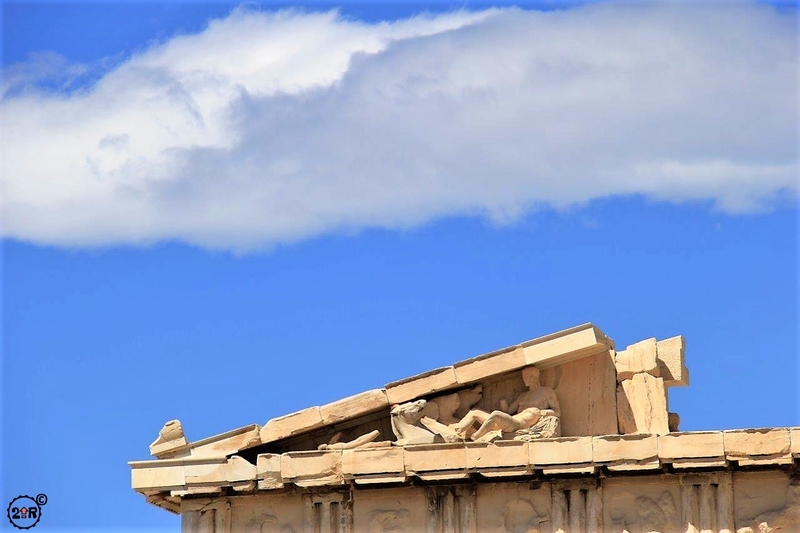 Books could be written on the history and significance of the Parthenon, and in fact many have been. 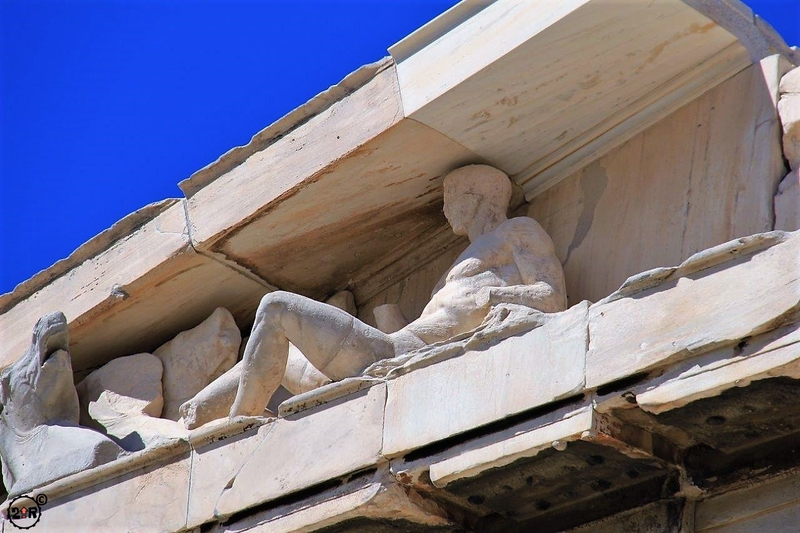 There is also a particularly well-produced documentary by PBS on the Parthenon and its secrets. The Parthenon was for many centuries the focus of Greek and Athens life and while it stood undamaged, was a spectacular sight to behold. 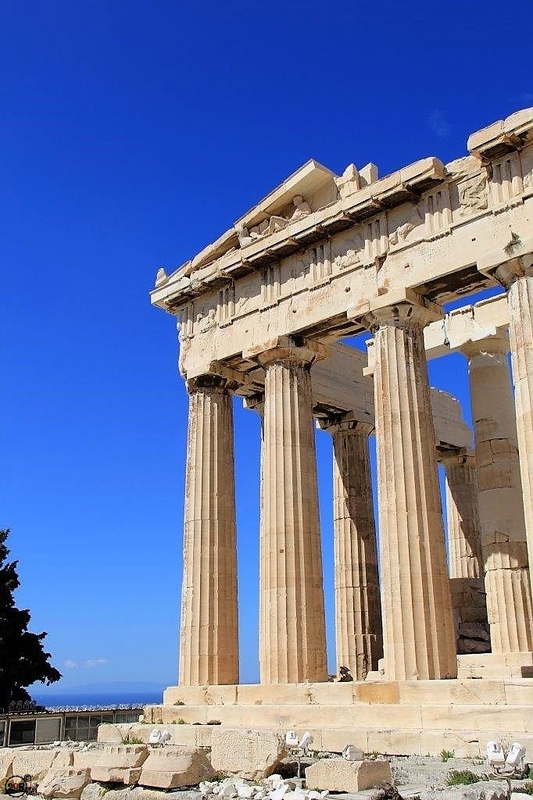 Constructed in just 9 years in the mid 400s BC, it is an architectural, engineering, and visual masterpiece. 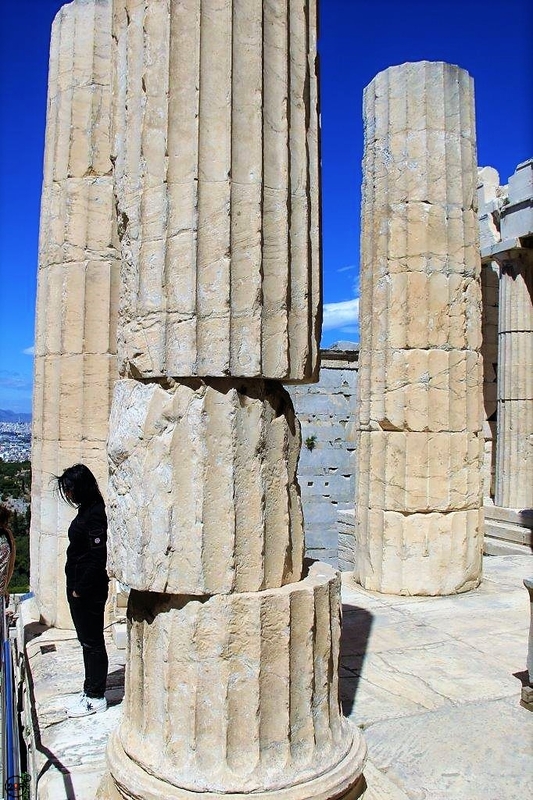 The architects of the Parthenon are believed to have been keenly aware of optical illusions, understanding that due to its size, they needed to design certain elements that, when constructed, the building would appear perfect. There are reportedly no right angles in the building, and the floor of the structure is bowed in such a way that, when viewed from one end to the other, it appears perfectly flat. Consider for a moment that the marble from which it is constructed, Pentelic Marble, hails from Mount Pentelicus over 12 miles (20 km) from the Acropolis. The marble was treasured for its bright white appearance when fresh, with just enough yellow that is shone like gold when the sun hit it at sunrise and sunset. It must have taken a Herculean (no pun intended) effort to get that much stone from one place to the other, and then up that hill. What is equally or perhaps more amazing if the level of craftsmanship and engineering/architectural skill that went in to the construction. Complex math and drawing as well as creative design went into crafting each and every piece of stone column as each one was unique. Although the columns look interchangeable, they are not. The craftsmanship of the carving and fitting of each piece of stone is as mind boggling as any of the efforts. historians and restorers are amazed at the precision with which each piece fits to the other. Over time, as cracks have formed due to earthquakes and other causes, the cracks often transfer uninterrupted from one column section to the other, not stopping at the joint, as if the two pieces were one! Wooden blocks, fitted exactly in the center of two joined column rounds, have been exposed during reconstruction and are as fresh as the day they were entombed. The finishing of the surface of each piece is to a standard we cannot replicate today. Historians believe the Ancient Greeks had tools and methods that exceed our capabilities, but their secrets have died with them. Sadly, the state of the Parthenon we see today is essentially the result of one mortar round fired by the Venetians in 1687 from Philopappos Hill. The Turks had occupied the Parthenon during the Great Turkish War and had used the Parthenon to store their gunpowder. When the mortar round hit the gunpowder stores, it destroyed most of the Parthenon and several other nearby buildings. 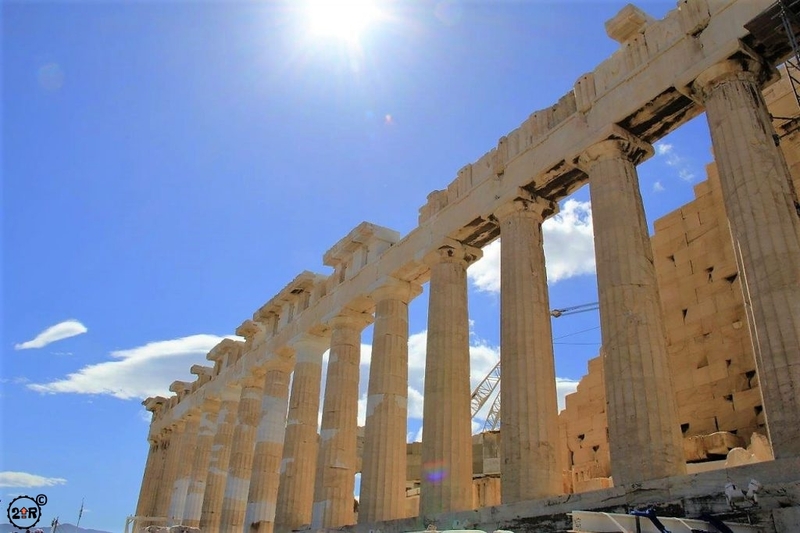 Since 2002 there have been efforts underway to at least partially restore the Parthenon. In 2020 more than double the amount of time will have elapsed trying to restore it as it did to build it in the first place. Think about that! 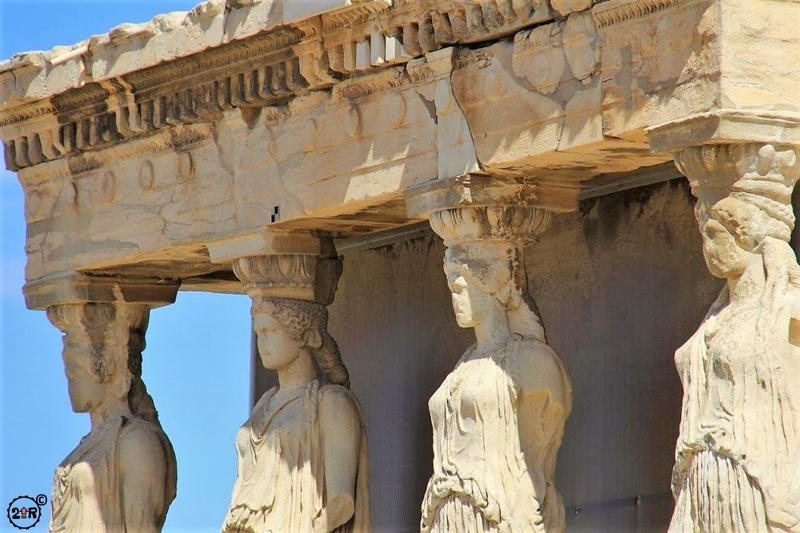 The Erechtheion and porch of the Caryatids, with its 6 female figures as columns, is a beautiful building just north of the Parthenon near the edge of the Arcopolis. 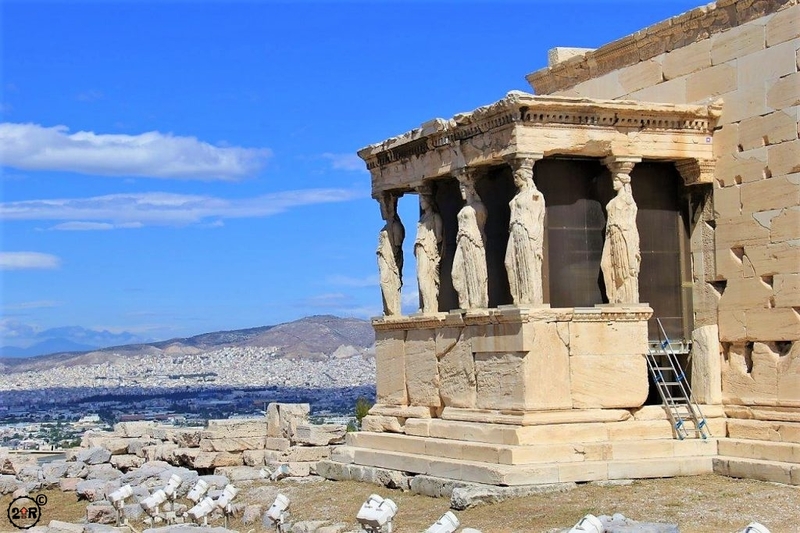 It was built in the late 400s BC by the same sculptor and mason that constructed the Parthenon. 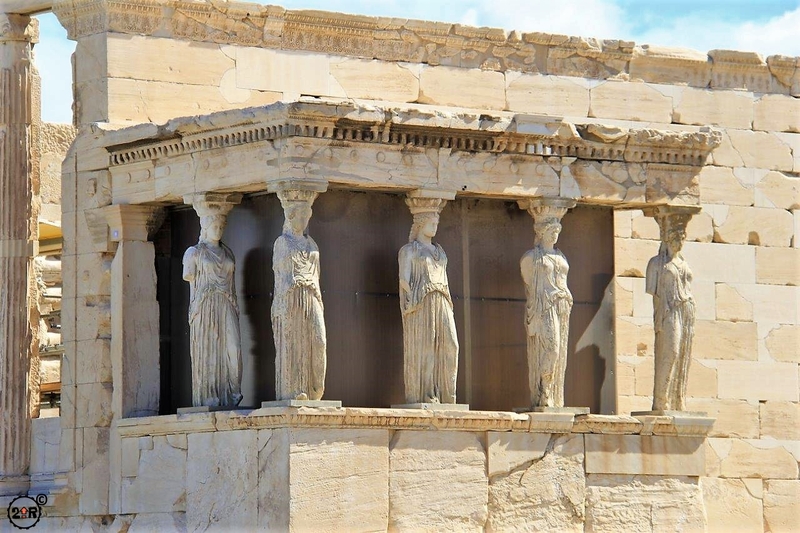 One of the 6 female figures was removed by Lord Elgin (the same one that removed the “Elgin Marbles” from the frieze of the Parthenon) and taken to his estate in Scotland. It was then sold to the British museum. 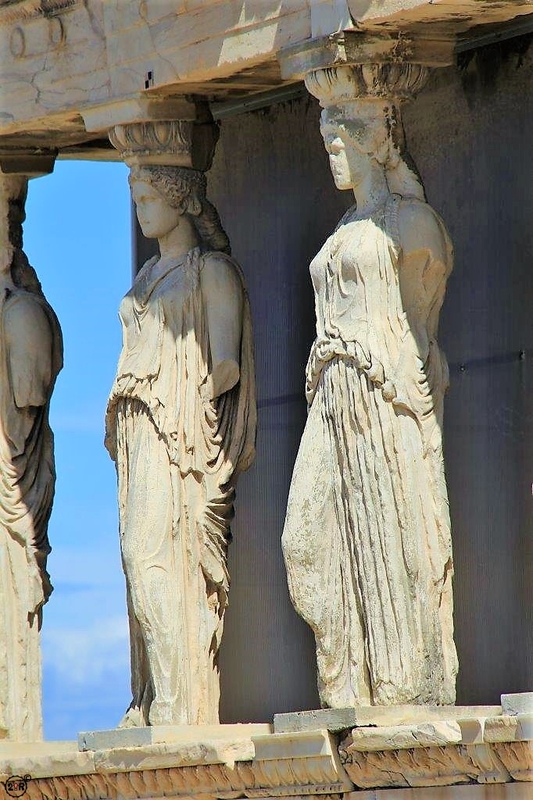 The other 5 female figures were removed in the late 1970s and placed in the Acropolis museum. Exact replicas of all 6 now stand at the porch. 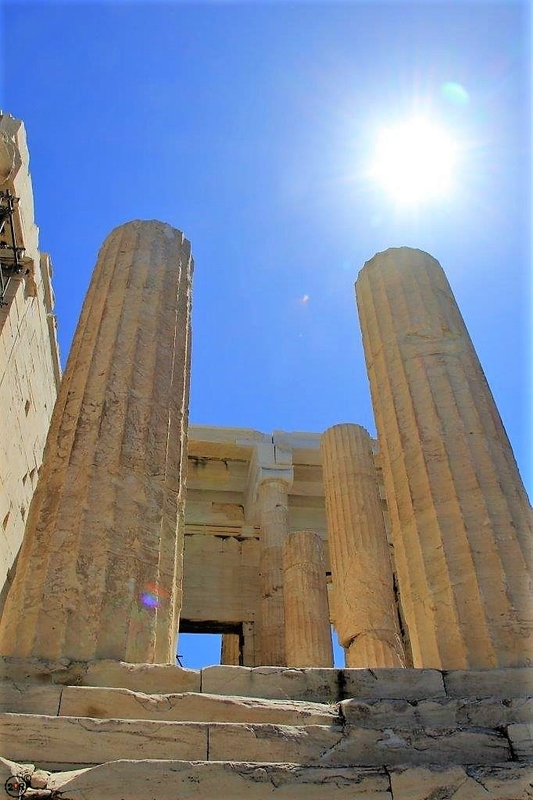 The Temple of Athena Nike (not to be confused with the Temple of Athena, aka, the Parthenon) is situated on the west side of the Acropolis right next to the Propylea, the majestic entrance to the Acropolis. The Temple was built in the late 400s BC in the same located where a temple was destroyed by the Turks in 480 BC. 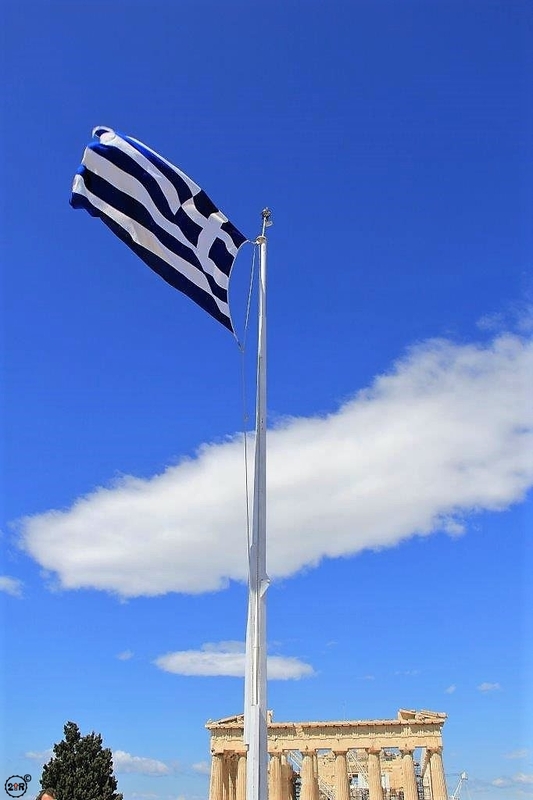 It was created to honor the patroness of Greece, Athena Nike. FYI, Nike in Greek means victory. 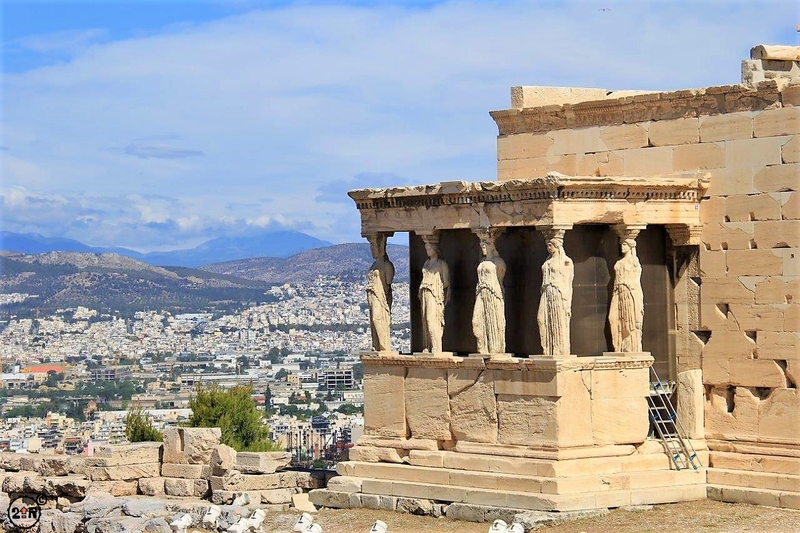 The original frieze around the building is housed in both the British and Acropolis museums as the ones on display at the temple are replicas. 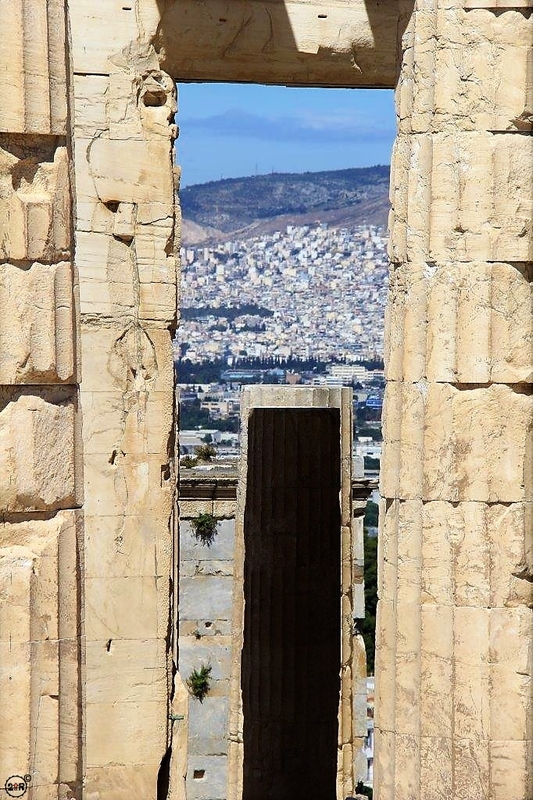 You can’t miss the Propylaea at the entrance of the Acropolis and it’s a really cool and majestic structure. It’s excellent for photos as its lines are amazing. 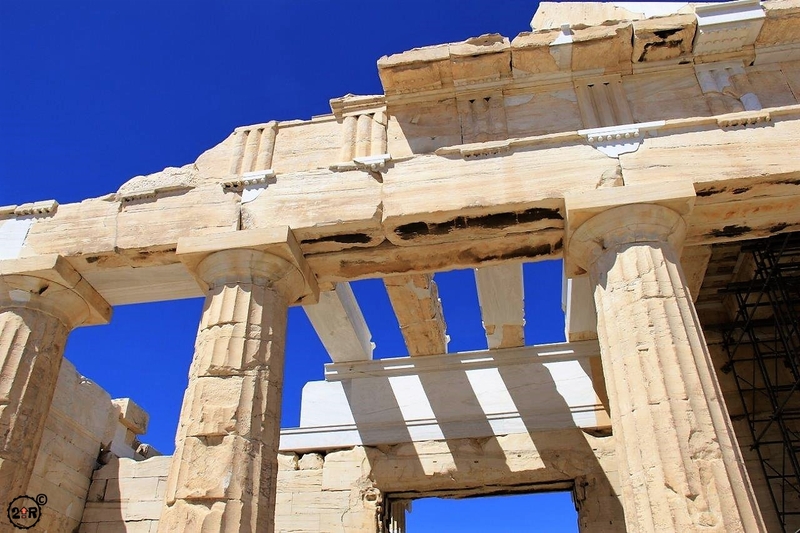 In its original state it looked very much like the Brandenburg Gate in Berlin (which was created in the Greek Revival style) and was a magnificent way to enter such an impressive place as the Acropolis. You also shouldn’t miss the opportunity to explore the Theater of Dionysus and the Odeon of Herodes Atticus. The Odeon was built in 161 AD and was a magnificent theater that could hold 5,000 people. 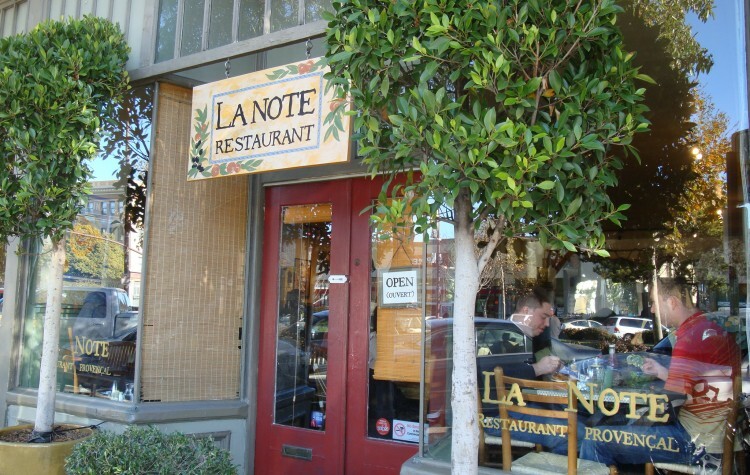 With its front wall and wooden roof, it was a sight to be seen. Unfortunately it was destroyed at a pretty young age of just 106 in 267 AD and doesn’t look much different today nearly 2 millennia later. It’s been used over the last half century for all kinds of concerts. The Theater of Dionysus was the first theater ever constructed and dates to about 500 BC. The original theater was changed to what we see now, in about 300 BC. 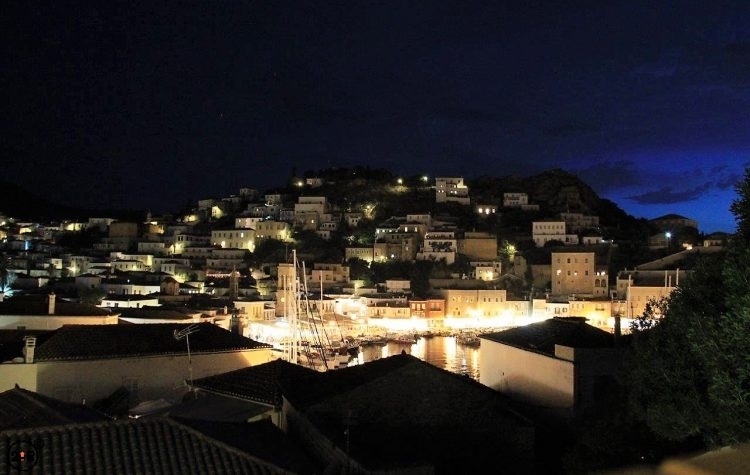 At a capacity of 17,000 with excellent acoustics, it was the location of the Dionysia, a great festival and the birthplace of tragedies and comedies. The Ancient Agora was a large public gathering place/marketplace to the northwest of the Acropolis and within it is the Temple of Hephaestus. 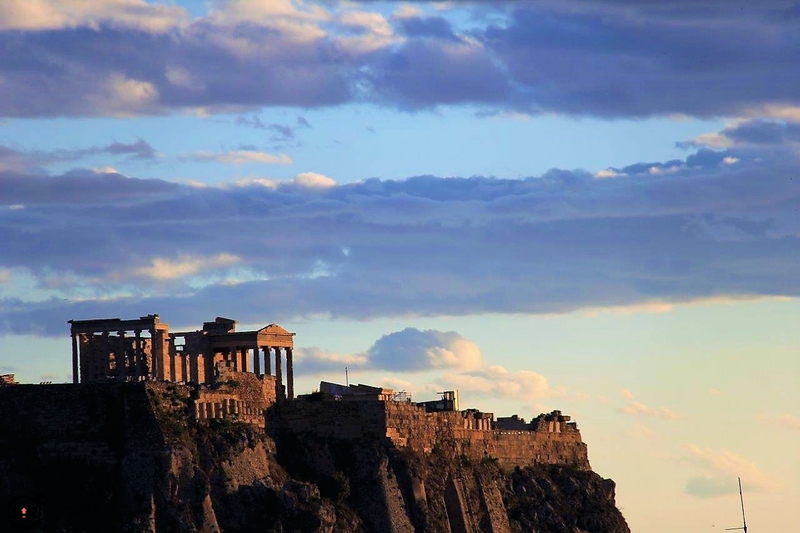 The Temple of Hephaestus was built around 450 to 430 BC, about the same time as the Parthenon. Amazingly, as it stands now is largely how is was built almost 2,500 years ago! It’s incredible to stand at this building and see its grandeur, then sit back and imagine what the rest of the Agora looked like back then. 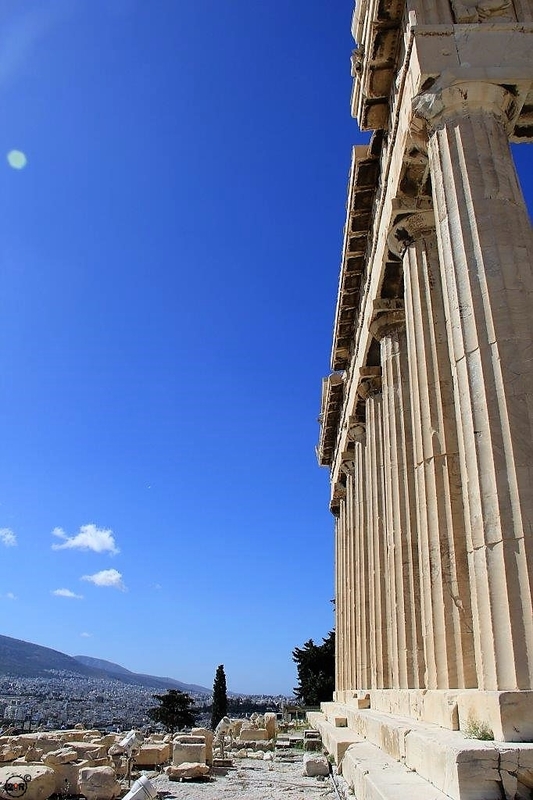 Then think about what the Acropilis with the Parthenon and other beautiful structures must have looked like. It would have been a sight to behold!